Former Campbell defensive back Carlos Merritt has made the final 52-player roster for the Alliance of American Football’s Atlanta Legends. The Legends, along with the seven other AAF franchises, locked-in their opening day rosters for the league’s inaugural season on Wednesday. Atlanta will help kick off the new professional league Saturday, February 9 at Orlando (8 p.m.). 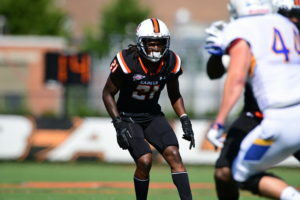 Merritt totaled 168 tackles in three seasons (2015-17) for the Camels after transferring from South Carolina State, seeing action in 31 Campbell games. 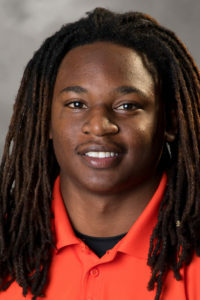 The Union City, Ga. native was named First Team All-Pioneer Football League as a senior in 2017, leading the PFL and tying a Campbell single-season record with six interceptions. He added 94 total tackles, the second-most ever by a Camel in a single season. CBS will broadcast the AAF’s Feb. 9 opening day, while CBS Sports Network will then carry one AAF game each week throughout the season. Merritt is the latest Camel to sign with a professional football squad, joining former defensive tackle Greg Milhouse (2014-15), who initially played for the New York Giants in the 2016 NFL preseason, and then with the Seattle Seahawks in 2017. Milhouse also saw time with the Saskatchewan Roughriders of the Canadian Football League in both 2016 and 2017. Long snapper Daniel Dillon (2011-15) also played in the 2016 NFL preseason for the Arizona Cardinals after signing as a free agent. Quarterback Brian Hudson (2013) signed with the CFL’s Calgary Stampeders in 2014, and later signed and played with the New Orleans VooDoo of the Arena Football League in 2014, and the Colorado Ice of the Indoor Football League in 2015. Another former Campbell QB, Daniel Polk (2008-10), was the first Camel to play at the professional ranks, inking a contract in Germany’s top division with the Stuttgart Scorpions in 2011. Ugonna Awuruonye (Atlanta, 2016) and De’Shawn Jones (Seattle, 2018) have also attended NFL rookie mini-camps.